A Cal Fire firefighter monitors a burning home as the Camp Fire moves through the area on November 9, 2018 in Magalia, California. Fueled by high winds and low humidity, the rapidly spreading Camp Fire ripped through the town of Paradise and has destroyed numerous homes and businesses in a matter of hours. Celebrity mansions shoot flames from their rooftops like architectural fire pits. Farm animals tied to lifeguard booths crowd beaches lit orange-red by the conflagration. Fleeing motorists drive blindly through walls of flame and black smoke, only to find themselves blocked by abandoned cars on a strip of melting asphalt; on either side, houses ignite, embers pop, flames leap, and burning trees come crashing down. Coroners’ teams sift through the wreckage, enlisting anthropologists to identify shards of bone. California wildfires are setting records again. The Camp Fire in the Northern California foothills and the Woolsey and Hill fires northwest of Los Angeles, all started on Thursday, November 8, as humidity plummeted, and hot, dry winds whipped over vegetation parched by years of drought. As of late Monday, November 12, they had burned a combined 215,000 acres and counting and killed at least 44 people. Paradise, a mountain town of 27,000 in Northern California, has been leveled. The Woolsey Fire in Southern California has burned more than 93,600 acres—146 square miles—in western Los Angeles County and southeastern Ventura County since Thursday, including parts of upscale, beachside Malibu. Residents of Thousand Oaks, where 12 people were killed in a mass-shooting at a country music bar just days before, were among the more than 250,000 forced to evacuate their homes. And still, the fires grow and multiply. 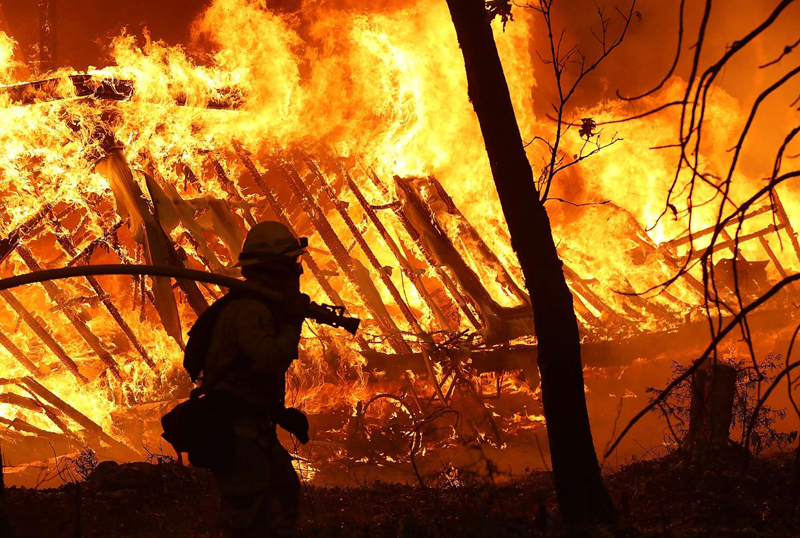 If firefighters, climatologists, and California’s governor are correct, these infernos are only a taste of the destruction California will face in the coming years. At about 6:30 a.m. on November 8, firefighters were dispatched to the North Fork of the Feather River in the Sierra Nevada foothills. Burning vegetation had been reported beneath PG&E’s high-tension power lines near the Poe dam. When the first firefighters arrived at the site at 6:43 a.m., they knew they were seeing the beginning of a potential conflagration. California’s Mediterranean climate makes for two seasons: a long dry summer and a mild, wet winter. It’s good for agriculture, but dry summers make for prime wildfire conditions. In the past, autumn rains would have ended Northern California’s fire season more than a month before the Camp Fire started, said meteorologist Craig Shoemaker of the National Weather Service in Sacramento. October 1 is the official beginning of the wet season. But this year was quite different. At the site of the fire early that morning, firefighters reported 35 mph winds. The winds would peak at 60-70 mph that day, whisking the swelling flames down the Feather River canyon toward the small towns at its base. Winds like that are not abnormal for fall and winter in California, Shoemaker said, when the Great Basin desert is cooler than the California coast. Cooler, high pressure air over Nevada and Utah flows toward the warmer, lower pressure air on the coast, and that creates the wind. Winds forced through narrow gaps in California’s north-south running mountains and down steep canyons move even faster, like water in a narrowing riverbed. As it flows downhill, the air gets hotter and dryer. Scott McLean arrived in Paradise around 8 a.m. as the fire was already engulfing the southern side of town. McLean is a 21-year veteran of the California Department of Forestry and Fire Protection—and Cal Fire’s chief spokesperson since 2014—but he was still stunned by what he saw. “Hell,” was the only word he had for it on Sunday. Wrecked and abandoned cars blocked the roadway, said McLean. Everywhere, there were flames, smoke, and wreckage. He thinks it was around 9 o’clock, though he can’t remember for sure, that smoke filled the sky and turned the morning dark as night. As he drove around in search of safe exit routes, he came upon an elderly woman in a wheelchair alone on an empty section of road, pushing herself through the maelstrom. For hours, firefighters could only try to save lives. There was nothing they could do to contain the erratic, wind-whipped blaze. Southern California’s Santa Ana fire season starts in late September. By then, Northern California has usually had enough rain and snow to prevent fires, and their firefighters are available to help out down south. Not this time. At 2 p.m. Thursday, as the Camp Fire continued to rage uncontrolled in and around Paradise, two brush fires broke out 40 miles northwest of Los Angeles. Stoked by the same hot, dry winds—called Santa Anas in Southern California—they spread. The Hill Fire started in the Santa Rosa Valley, a few miles northwest of Thousand Oaks. Fourteen miles to the east, the Woolsey fire began on a hillside next to the old Santa Susana Field Lab, a hazardous site in Ventura County contaminated by decades of rocket and nuclear reactor testing and a partial meltdown in 1959. At first, the Hill fire was the more worrisome, quickly burning through 140 square miles. But as it entered the 24,000-acre footprint of a major 2013 fire, it had far less fuel to burn. The Woolsey fire took center stage, raging south through the endless suburban sprawl, and jumping the 101 Freeway in several places. It was zero percent contained as it roared through Malibu. At a town hall Sunday evening in Woodland Hills, which straddles the 101 northeast of Malibu, some 350 evacuees packed a high school multipurpose room, many expressing frustration that firefighters couldn’t control the flames. The multi-agency firefighting force in Southern California has been called the most robust in the world. But still, their resources have been strained. Monday, Cal Fire announced that firefighters were being deployed from Washington, Oregon, Idaho, Utah, New Mexico, Texas, and Montana to help fight California’s fires. Last December, the Thomas Fire burned through 281,893 acres (440 square miles) in Santa Barbara and Ventura counties. It became the largest wildfire in California's recorded history. Firefighters said they’d never seen anything like it before. That fire was eclipsed just eight months later by the Mendocino Complex fire, which ravaged the wine country in the middle of the state and whipped up a deadly fire tornado, baffling firefighters as well as civilian onlookers. This week, firefighters in Northern California told reporters they’d never seen a fire move so fast as the Camp Fire that destroyed Paradise. As fire officials express awe at the state’s ever more catastrophic blazes, they don’t hesitate to name the reason. The trend of warmer, dryer autumns precipitating faster, bigger, more dangerous fires is projected to continue indefinitely as greenhouse gases heat the planet. In an op-ed last summer, climate scientist Daniel Swain of the University of California, Los Angeles, wrote that California’s governor Jerry Brown mischaracterized the recent siege of wildfires when he said they were California’s “new normal.” “It would be a mistake to assume that the region has reached any semblance of a stable plateau,” Swain said. He urged California's cities and officials to plan for a future of ever-worsening mega-fires.